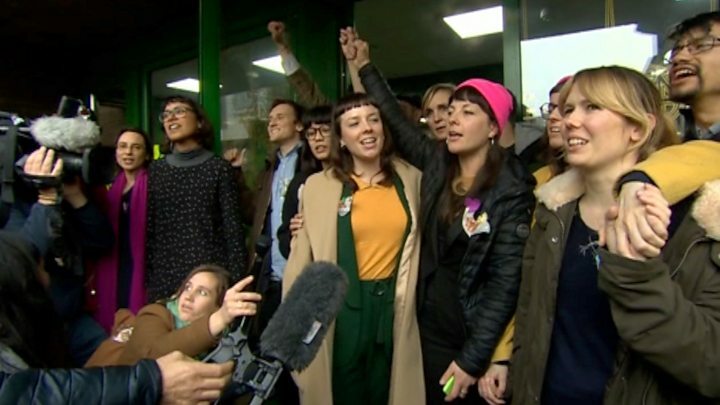 Fifteen protesters who chained themselves to a plane to stop it deporting people to Africa have avoided immediate jail sentences. 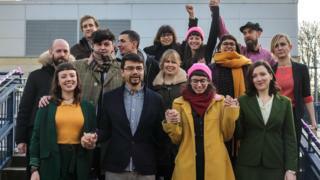 Dubbed the Stansted 15, the group broke through a fence at the airport in a bid to reach the jet taking 60 people to Nigeria, Ghana and Sierra Leone. They were found guilty of endangering the safety of an aerodrome. Three were given suspended jail terms and 12 received community orders at Chelmsford Crown Court. They used bolt cutters to enter Stansted Airport and attached themselves to the Boeing 767 using tubes and expanding foam on 28 March 2017. 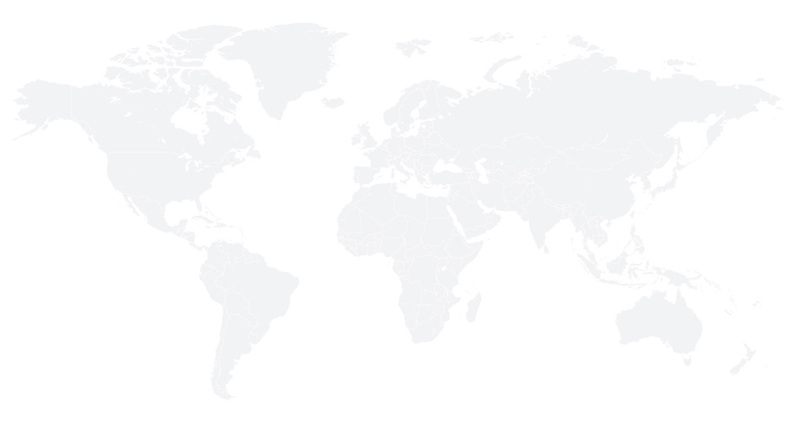 The runway was closed for more than an hour and 23 incoming flights had to be diverted to other airports. Passing sentence, Judge Christopher Morgan told the 15 that while he accepted the group were seeking to demonstrate in support of their cause, they had come “perilously close” to causing a catastrophe. “There is no doubt that you understood that there were safety implications,” he added. In court, the judge faced some tough arguments from a top human rights barrister about his duties to balance the question of airport security with the need to protect freedom of speech and assembly. Judge Morgan said he did this through tempering his sentences – in other circumstances, he said, he would have jailed the lot of them. Some of the defendants looked jubilant and defiant. Others looked like defendants often do: exhausted by the process, somewhat remorseful and promising never to do it again. So if the Court of Appeal decides not to examine the convictions, this prosecution will stand as a warning to others of the type of charge they could face for endangering an airport. 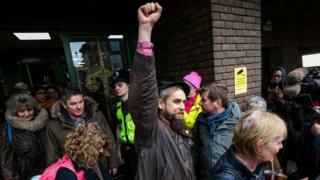 Three of the defendants, Edward Thacker, Alistair Tamlit and Melanie Strickland were given nine-month jail sentences, suspended for 18 months. The other 12 received 12-month community orders, with 11 of them ordered to carry out unpaid work. All 15 were convicted on 10 December last year under the 1990 Aviation and Maritime Security Act, which was brought in after the 1988 Lockerbie bombing. The defendants had said they were being prosecuted under the “little known” legislation, originally devised to combat terrorism and hjijacking. In a statement, the Crown Prosecution Service said it was never suggested to the jury that any of the 15 were terrorists. 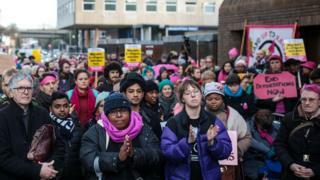 Prosecutor Tony Badenoch said the Crown would not be recouping the financial deficit caused by the protest; estimated to be more than £1m. New mother Emma Hughes, who gave birth between being convicted and sentenced, said the group were “massively relieved” none of them would be going to jail. Hundreds of people turned out to a demonstration outside the court, with crowds singing, clapping and waving banners. The courtroom was packed for the hearing, with extra space created in the public gallery and all seats filled. Helen Brewer, 29; Ferme Park Road, London. Lyndsay Burtonshaw, 28; Upper Lewes Road, Brighton. Nathan Clack, 30; Ferme Park Road, London. Laura Clayson, 28; Brownswood Road, London. Melanie Evans, 35; Vicarage Road, London. Joseph McGahan, 35; Path Hill Farm, Reading. Benjamin Smoke, 27; Rowley Gardens, London. Jyotsna Ram, 33; Brownswood Road, London. Nicholas Sigsworth, 29; Ferme Park Road, London. Melanie Strickland, 35; Borwick Avenue, London. Alistair Tamlit, 30; Brownswood Road, London. Edward Thacker, 29; Ferme Park Road, London. Emma Hughes, 38; Vicarage Road, London. May McKeith, 33; Vicarage Road, London. Ruth Potts, 44; Ashton Gate Terrace, Bristol.